ROSCA, short for Rotating Savings and Credit Associations, is a time-tested concept where a group of individuals meet for a defined period of time to save and borrow together. This concept is common in developing countries and among immigrant groups in developed countries. It is popular in these communities due to the lack of access to formal financial services, and experiences with unaffordable interest rates. ROSCA are known as tandas in Latin America, hui in China, chit funds in India, and cundinas in Mexico. 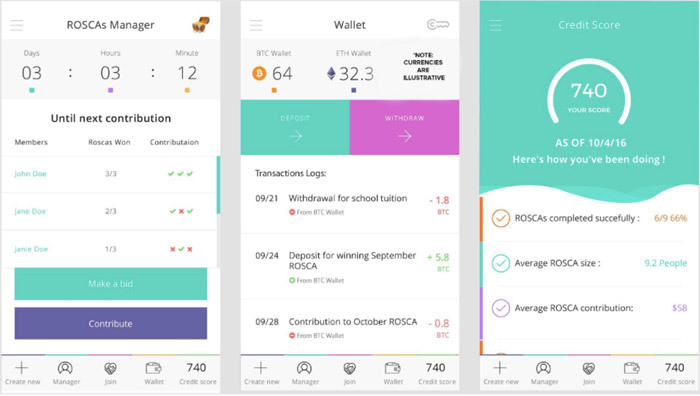 The way ROSCA works is that members pool their money into a common fund, generally structured into weekly or monthly contributions, and money is withdrawn by a different member each cycle. These savings pools can be consolidated and disbursed to members that are in need, or accumulated for future investments or emergency ‘rainy day’ funds. These days, digital forms of ROSCA include websites providing such services such as eMoneyPool, Puddle, MoneyFellows and Monk. WeTrust innovates on the ROSCA concept by automating processes using smart contracts. The team behind WeTrust believes that by using blockchain technologies, ROSCAs can be made more convenient, scalable, and enable value added features. 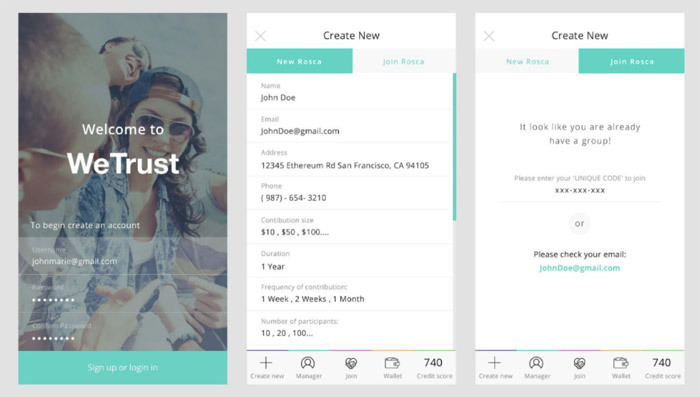 The aim for WeTrust is much larger with plans for credit scores, mutual insurance, and more diverse forms of lending. However, for the purposes of this article, we will be focusing only on their first decentralised application (dApp) which is based on ROSCA, scheduled for launch in January 2017. The WeTrust ROSCA works almost like a peer-to-peer savings/ lending circle among trusted groups of friends. 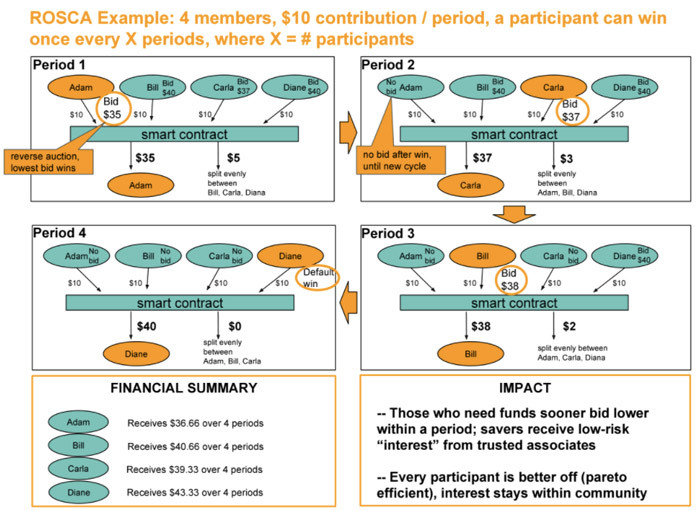 While there are several types, the example below shows one that uses a reverse auction to determine how to distribute the funds each period. The picture below gives a good illustration of how it works. This ROSCA has 4 members contributing $10 per period for a total of $40 per period. At the start of each period, each member can submit a bid to take home the entire amount for the period. The lowest bidder will win the total amount for the period and one will submit a lower bid only when one needs the money the most. This serves as a loan with a built-in interest rate mechanism among the ROSCA members. During the next period, the cycle repeats itself with the exception that the previous winner cannot submit a bid and will still need to make contributions until the end of the 4 periods. (Here is another video example provided by the Mercatus Center which illustrates several different types of ROSCAs). During an interview with George Li, one of the co-founders at WeTrust, he mentioned that there will be safeguards in place to ensure that participants do not submit extremely low bids that end up detrimental to their financial well-being. He also mentioned that in the initial version of WeTrust, ROSCA groups are to be formed among trusted friends and family to ensure that cases of fraud are minimised. In the future, once the system is more established, there are plans to establish a blockchain-based credit score for each member and ability to co-sign as back-up in case another user defaults. With this, the system can be made more open to individuals who do not know each other directly. WeTrust plans to generate revenue through fees that are set by the users themselves, with a maximum cap in place. The team behind WeTrust is strong: Ron Merom - previously a Tech Lead and Senior software engineer at Google, Patrick Long - a crypto-currency fund manager and former auditor at Ernst and Young who has his CPA, George Li - a startup veteran who founded CottonBrew and was previously a consultant at McKinsey and PM at Google. It will be exciting to watch the development and adoption of WeTrust as they launch their MVP in January 2017. Do read their whitepaper to learn more about their plans for the future.